January 4, 2017 – WILD CARD WEEKEND!!! In this episode, we wrap up the regular season with our loss to the Patriots, and we set our sights on the playoffs, as we discuss our upcoming Wild Card Game against the Pittsburgh Steelers. 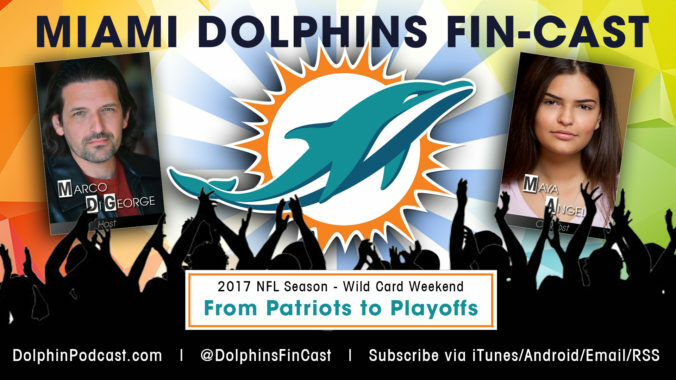 Also, we give you our FinsUp and FinsDown for the week, review the latest Dolphins news, take a look Around the NFL, review the final regular season NFL Scores and Standings (as well as reviewing the Playoff Picture), and give you our Picks of the Week, where we run through our thoughts for the Wild Card Games. Go FINS!